All television channel is focusing on Dance Based Talent Hunt Shows. Recently, we have published a article on 'Dance Plus' Reality show of Star Plus. But how can we forget India's Largest Dance Based Zee Tv's Dance Show 'Dance India Dance' which provides a platform for our youngsters to show their talent. In 2015, Zee Tv is coming soon with its new season of 'Dance India Dance-Season 5' . The show will be expected to start from 27,June,2015. The television show that enriched the average Indian's dance vocabulary with concepts like Locking and Popping, Lyrical Hip Hop, B-Boying, Kalaripayattu, Paso Doble, Slo-Mo and Aerial is back on the tube. Fans of the show from across the country can rejoice as India's most definitive platform for dance - Zee TV's Dance India Dance returns to your screens this June with an all new season 5. The platform brought respect and recognition to dance as a vocation and introduced India's entertainment fraternity to some of its finest dancers and choreographers. 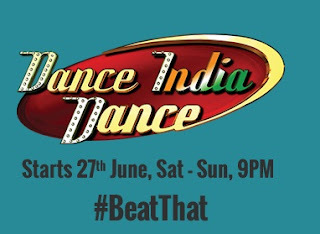 With each successive season, DID has set higher and higher benchmarks for excellence in dance and the new season presents itself in the form of the 'Biggest Battleground of Dance', where each participant will set a certain standard with their dancing prowess and challenge the other to BeatThat! The auditions for DID Season 5 began in April and were held across 17 cities to scout for the most deserving dancing talent. To groom the contestants and bring out the best in them, DID 5 brings on board an all-new, young trio of masters- the charming Muddassar Khan, the dynamic danseuse Gaiti Siddiqui who's been a coach and creative guide for countless DID stars over the years and an immensely popular former contestant of DID Punit Pathak. Actor Mithun Chakravarty is the Grand Master on the show. Veteran Bollywood Actor Mithun Chakravarty returns as the Grand Master on the show. Geeta Kapur, Terence Lewis and Remo Dsouza will also be seen as Judges in the show. Jay Bhanushali will expected to host the Dance India Dance -Season 5. DID season 5 2015 Participants between the age group of 16 to 30 years. The participant agrees to sign this terms and conditions and confirms to agree to abide by the same as mentioned. Upload your dance video here to participate in India’s biggest dance platform. It’s time to show the world your amazing dancing talent! Click On Below Link to Upload Your Video . Dance India Dance-Season 5 is starting from 27,June,2015 at 09:00Pm on Zee Tv.